This recipe makes 13 to 18 pints, depending on how liquid you want it. I usually end up leaving quite a bit of liquid in the pot when I fill my jars–which I turn into spicy tomato soup using an immersion blender and a can of peeled plum tomatoes. 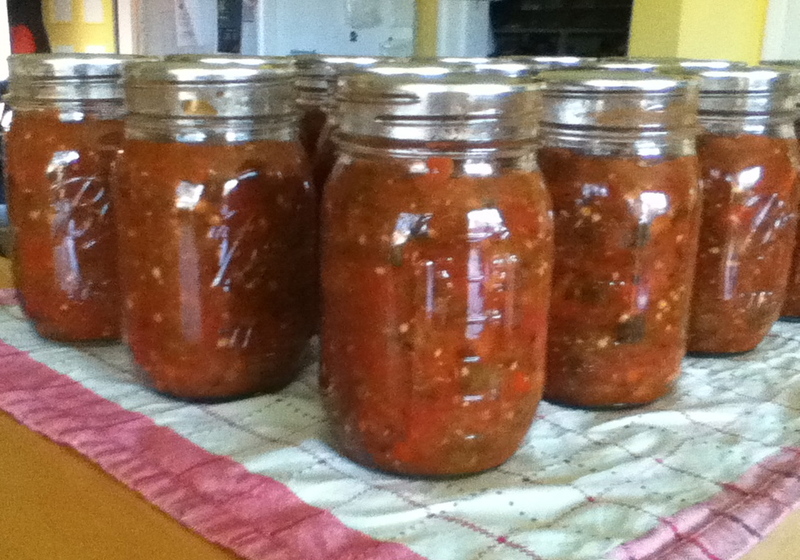 But you could use all the liquid and have more, but thinner salsa. Bring ingredients to a boil in a very large pot (I use a 12-quart pot). Lower the heat and simmer uncovered about 30 minutes, until reduced. Then I ladle it (leaving much of the liquid behind) into sterilized pints leaving a 1/2-inch head space, top with lids and rings, and boil in a water canner for 15 minutes. There is nothing more satisfying than the sight of those jars on my counter. Oh, also the salsa is delicious. Did I mention that?